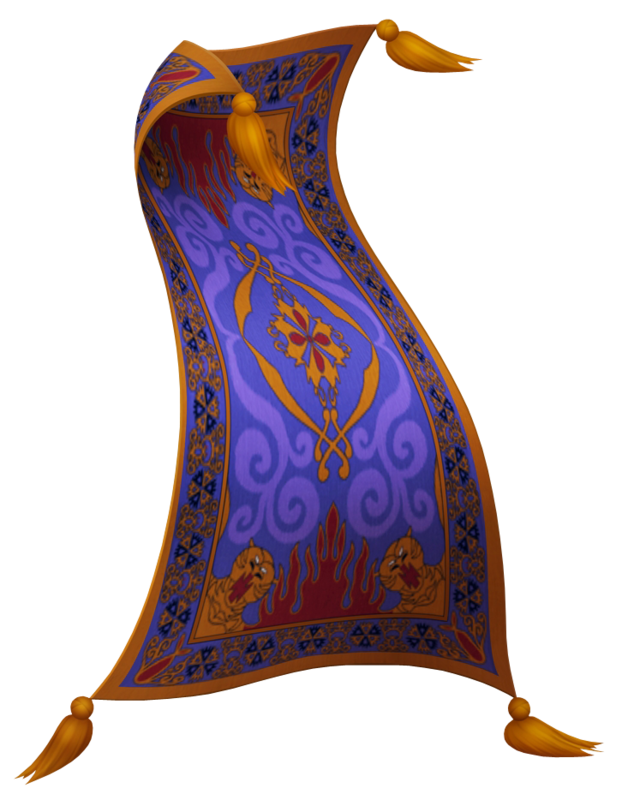 A thinking, flying carpet discovered by Aladdin in the Cave of Wonders on the same visit in which he discovered Genie's lamp. This silent companion is first met stuck under the corner of a cabinet, and when released flies off into the desert, which soon leads Sora, Donald and Goofy to rescue Aladdin and Abu. He ferries the heroes afterwards away from the Cave of Wonders, and later when Jafar is defeated and the Cave of Wonders begins to collapse, Carpet is on hand to help them escape safely. Later on, it is also free to take Sora out into the desert to confront the formideable Kurt Zisa, and returns him when he is victorious. An unspeaking, finely-woven magical carpet, it is able to both think for itself and fly. It was discovered in the Cave of Wonders by Aladdin, and used to help them escape it, and deliver the party to and from their battle with Kurt Zisa. After his year spent travelling with Genie, he returns to Agrabah to aid Sora in his battle through the Sandswept Ruins and later in the final confrontation with Jafar. Not just your everyday vintage rug from the bargain bazaar, the carpet is indeed a thing to behold. Able to feel emotions and interact upon them, Roxas first encounters the carpet with Genie in the middle of the Agrabah desert. Upon their introduction, Carpet immediately believes that Roxas is in fact, Sora, but because Genie is unable to see the resemblance and understand, the claims were dismissed without a second thought.